Kohaku remains as the top highly searched for variety of koi pets because of their desirable red and white marking on their body. 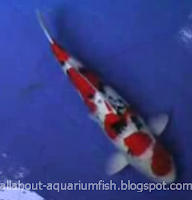 An adult kohaku can fetch a hefty sum and koi pet collectors often look for the best overall appearance judged by the good mix from the ratio of red and white marking distribution on the body. The one that is highly prized after is the kohaku that has the red color pattern that resembles a zigzag lightening bolt pattern that begins from the head up to the tail end. Between one fish to another, kohaku can look pretty much alike and identical in terms of the pattern marking even though each individual fish have different genetic makeup. 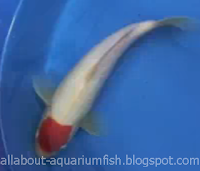 There is actually no way to control the red patch distribution and while you can select the best male and female variety with a desirable pattern as quality pets, this will not ensure that you will get the koi offspring with the zigzag marking that you want. Tancho is defined with the presence of red patch marking on the head region and the best desirable characteristic should be the one with the spot appearing as round, circular or oval. In fact, a highly prized variety should have the patch appearing as dark red color (and not orange). The marking can appear on a completely all-white body background as seen with tancho kohaku koi pets while other tancho koi varieties have mix of black color patches distributed on the body, like the tancho showa. Basically the fish is considered unique in the sense that you can never breed two tanchos together hoping to get a pure bred offspring. They actually originated based on random selection when among a batch of young white colored koi pets that you've selected, there's a chance for one or two to develop in a quality Tancho with the appearance of the desirable red patch on the head. Sanke is basically multicolored and the one most sought after by hobbyist as pets is the one with the right balance of red, white and black splotch distributed on the whole body. The fins must all be free from color marking and the black patch must not be more than the red and white. A fine specimen should have small amount of distribution for the black colored spots to appear sparingly across the body. They are considered the second most popular after the kohaku and breeders looking for the right sanke is often presented with the task of tedious selection among the young koi hoping that the one picked up will grow to become adult koi pets fish with the desirable color pattern and distribution. One of the secrets to having a healthy, prize-winning koi is by making sure you set up your pond to be as large as possible equipped with the best pond facilities.